Los Angeles and Las Vegas-based Janise Burrafato (45 and petite) works full-time in the tech world. This busy Mum of twin boys blogs about fashion, beauty and family life over at Mama in Heels. Janise is a Modern Classic dresser with a decidedly adventurous streak. Her style is ladylike and polished. She loves to have fun with footwear, statement jewellery, and investment bags. Janise also has a nose for a great bargain, and is a big fan of mixing high-end and low-end pieces. Structure and softness play well together in this classic and timeless trouser look. The bright pink and poppy floral print and soft drape of the feminine blouse provide softness up top. Janise’s wavy locks framing her face further emphasize that effect. A great juxtaposition with the strict and crisp fabric of the high-waisted wide-legged trousers. The pointy toe pumps, the elegant length of the pants — they are visually skimming the surface — and the tucked blouse create a long lean line on our blogger, who is pushing 5’2″. Also note how the dark bottoms and footwear bookend Janise’s black hair, while the cream satchel echoes the lighter colour of the blouse. Dainty gold necklaces, a big watch, and bright pink lipstick are the finishing touches. Janise is firmly on Team Mixing High-End with Low-end Pieces. For date night, she’s dressed up simple skinny jeans with a Zara blazer and Charlotte Olympia heels. The roomy, but not oversized, leopard print blazer brings oodles of oomph on its own. Throwing in the hyena print pumps makes for an extra playful and on trend look. 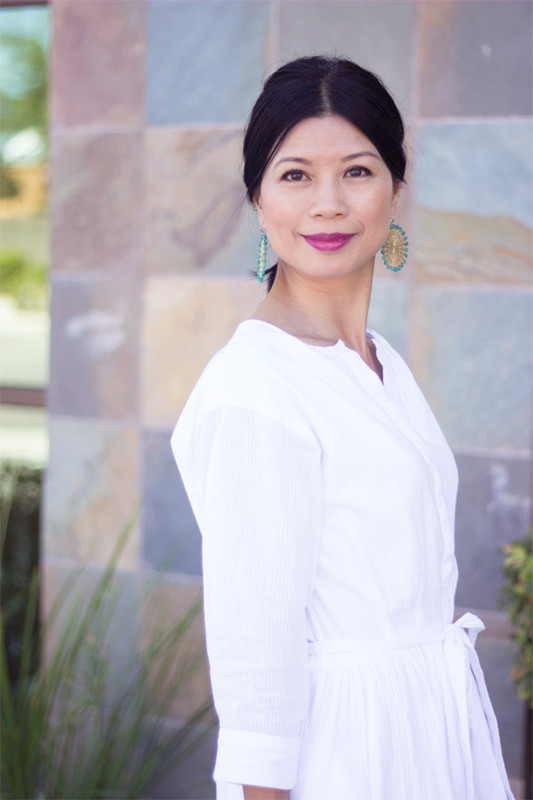 The white popover shirt feels a bit more relaxed than a classic button-down version, and the open neckline draws attention to the bold yet minimal Chanel-esque pearl necklace. The shirt and blazer are the same length, and end at a flattering point on the thigh. Turning up the shirt cuffs, sporting a bright red mini bag, and glamming it up with oversized sunnies and red lippie kicks the style quotient up another notch. 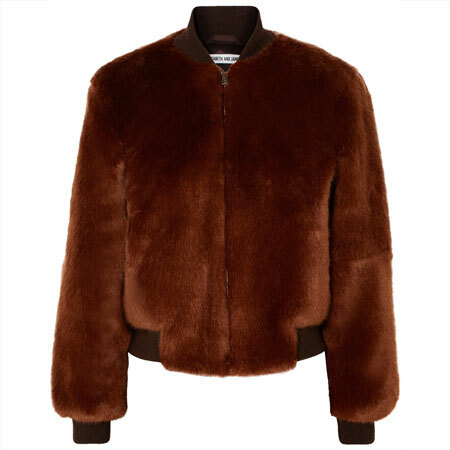 The high cosiness factor, unusual colour combo and soft-edge vibe of this texture-rich outfit have stolen my heart. At first glance, I thought the grape coated skinnies were actually leather pants. Doesn’t the colour look amazing with the light pinks. The volume of the oversized chunky cable-knit sweater is reined in by pairing it with skinny bottoms. I love the length of the jeans, and how they unzip to elegantly drape over the neutral-coloured lizard print heels. The quilted crossbody adds even more textural interest, as does the knotted cuff bracelet. There’s some subtle metal mixing going on as well with the gold bracelet, silver ring and silver hardware on the bag. A pair of eye-catching glass earrings add a lightness that works particularly well with this look. A shade of pink would have been the more obvious lipstick choice, but Janise went with an unexpected coral instead. Fab! Janise wore this striking white outfit to pay homage to one of her favourite holiday destinations: the Greek island of Santorini. It’s the perfect example of how to create a visually interesting look with “just” a simple dress and the right accents. 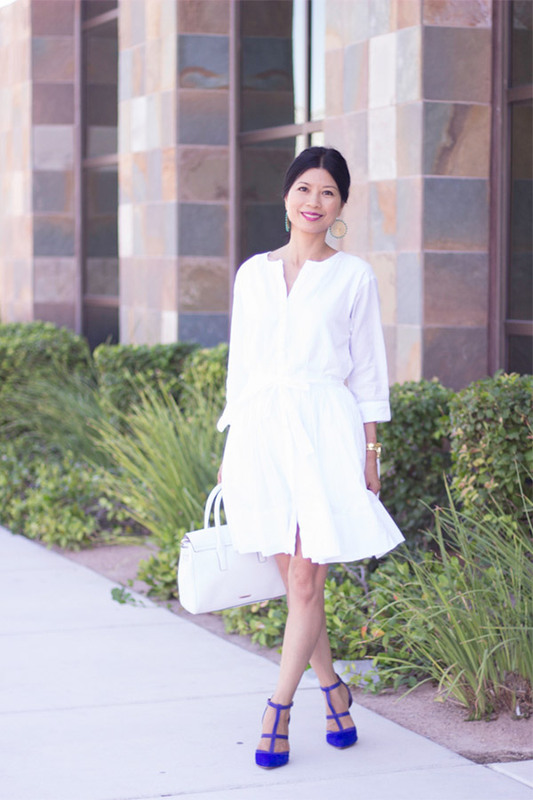 The white frock with pintuck detailing, thin self-belt and full skirt screams Summer to me. Its romantic vibe cleverly contrasts with the very bold strappy heels that combine lizard embossed leather with suede. Plus, the cobalt blue looks so fresh and kicky with all the white. The straps and rose gold hardware on the satchel add subtle colour and texture. Janise’s statement round vintage earrings work superbly with the pulled back hair, which in turn suits the casual vibe of the entire look to a Tee. A swipe of Janise’s trademark Yves Saint Laurent Beaute #12 lipstick, and our blogger is ready for a family lunch at a Greek restaurant. Once again Janise has built a (daytime) going–out look around a simple pair of jeans. This time she is wearing distressed, light-wash skinnies as slim-fit boyfriend jeans. Their nonchalant, lived-in feel is a great juxtaposition against the dressy pieces up top. Her velvet blazer and leather top add shine and texture in one go. The rich red colour of the tuxedo blazer feels lush and luxurious. I love how the daylight plays with the velvet fabric to create a sense of movement. The drape of the short black leather top and Janise’s hair worn down further emphasize that effect. Bare ankles and an open neckline create subtle allure. A chunky necklace in colours that complement her outfit, and a plum handbag that accentuates the rich shade of the topper finish off the look. Our blogger clearly has dressing fabulously for date night down pat. Here she is doing Sporty Luxe in head-to-toe silver. Such a fun and elegant take on the monochromatic look. 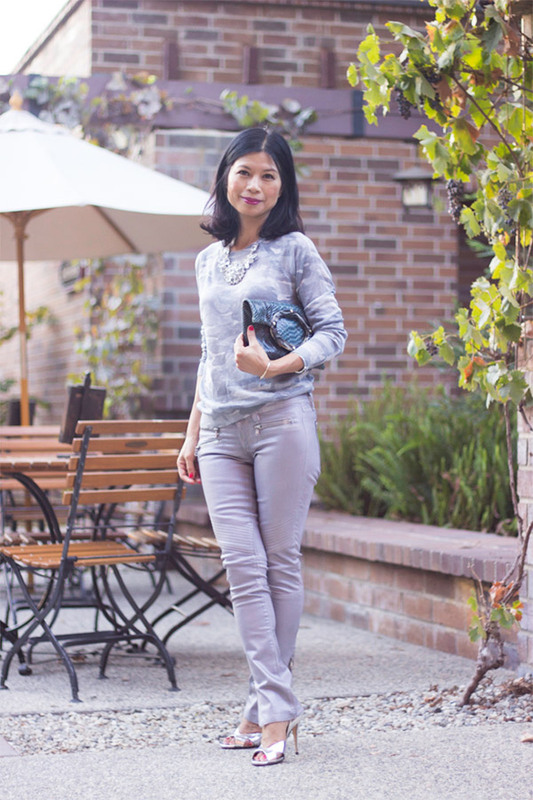 Janise has paired a camo print upscale sweatshirt with silver metallic straight leg jeans. Chic and on trend. The casual sweatshirt immediately feels more dressy in this silver colourway. It also has a silver thread running through it, which adds festive polish and complements the sheen of the jeans. The moto style detailing and zippers of the bottoms create a bit of tough, which is a nice juxtaposition with the ladylike silver sandals and sparkly crystal bib necklace. Finally, a grey-blue clutch with interesting round clasp brings a spot of pattern mixing to the look. Let us know in the comments what you think of Janise’s glamorous and trendy Modern Classic style. 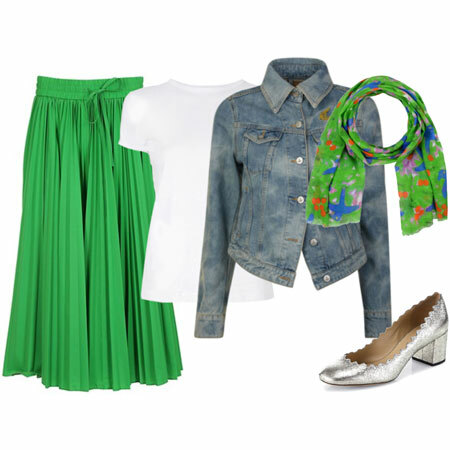 You can also browse the rest of her outfits on her blog, or find out what inspires her via her pinboards. Gorgeous! Love these looks that Janise sports. I’m struggling to pick a favourite outfit between the sweater and purple skinnies one and the one with the luscious cranberry velvet jacket. Off to peruse Janise’s blog and Pinterest. Thanks for the great write-up Inge! Absolutely fab! She does a great job of proving petite women can be stylish. All of these outfits are gorgeous, and I would wear them in a NY Minute. I especially love that velvet blazer – who knew someone could make a velvet blazer look so chic?! 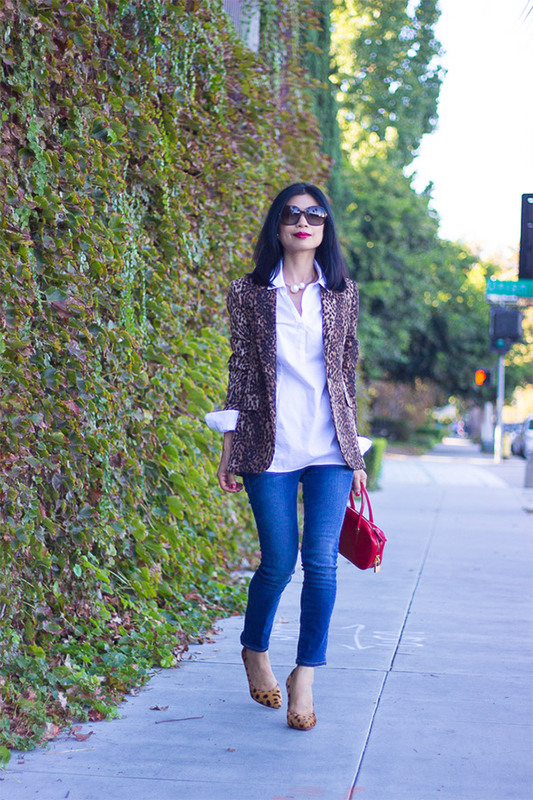 And the leopard print blazer – yes, please! Oh I’m in love w the first outfit! And sad that my warmer weather wide leg trousers aren’t high waisted enough to duplicate. Oh well! My wool wide legged trousers are. Anyway, her style is so varied; it was fun to see the same woman in such different looks! Oh I love Janise’s style!! 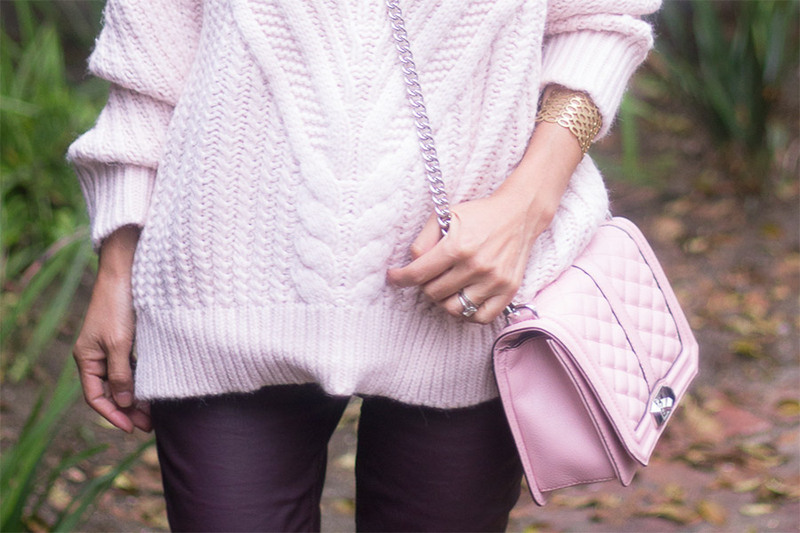 Especially the neutral monochromatic looks – adore the cable knit sweater and doesn’t the RM boy -esque bag look fabulous. The silvery outfit is also so gorgeous. Of course, my heart pitterpats for another longish blazer girl – who wears them wonderfully well. Janise definitely has elegant, edgy, cosy mama style down to a tee!! Kudos Janise!! Wow — Janice is so pretty, and I love her style! It’s so much fun to see how very well she wears her separates. Adore those blazers, especially. But the wide leg trousers outfit completely steals my heart. I also love that you placed it right next to the leopard blazer outfit, Inge — showing us that Janice looks equally smashing in a high waisted look and a lower “waisted” one (with the second look being a long over lean silhouette.) The other thing I loved was seeing all the colour and glimpses of skin. In darkest winter here, those kind of looks are hard to achieve, but I can still enjoy them on others! Thanks for the introduction, Inge. Janise has a wonderful look and shows that one can wear skinnies and wide legs with equal style. Love how she wear both knitwear and jackets, each with a mix of comfort and elegance. Especially enjoy the grape pants look, as well as the wide leg trousers. Fab blogger to feature! I’m always doubly impressed when the stylish blogger is also a mom because to me she’s doing triple duty! That white outfit struck me as the most beautiful but I loved many of the others. The distressed jeans didn’t speak to me much but the other refined looks are just wow. She is so beautiful! Amazing style. I met Janise via Visible Monday – she is a beauty with great personal style. Very pretty looks ! I like all of them….my favourite being the velvet blazer ensemble. She has a style that is very relatable yet interesting. Thanks for the introduction! Wow – These are indeed completely fab outfits. I like them all, and look forward to checking out her blog too! Inge, it’s hard to choose a favourite outfit because Janise looks beautiful in all her looks. Hmmm. I’m going to have to go with the 3rd look because it’s the most cuddly. LOVE the oversized chunky knit with the feminine addition of heels, structured satchel, bold lippie and statement earrings. Fabulous outfits! I am especially loving the pale pink and dark grape one as it reminds me of a favorite outfit I used to wear many moons ago. Inge, thank you for introducing us to Janise. Her style comes closest to my own aspirations (except for the heels) of the bloggers featured. 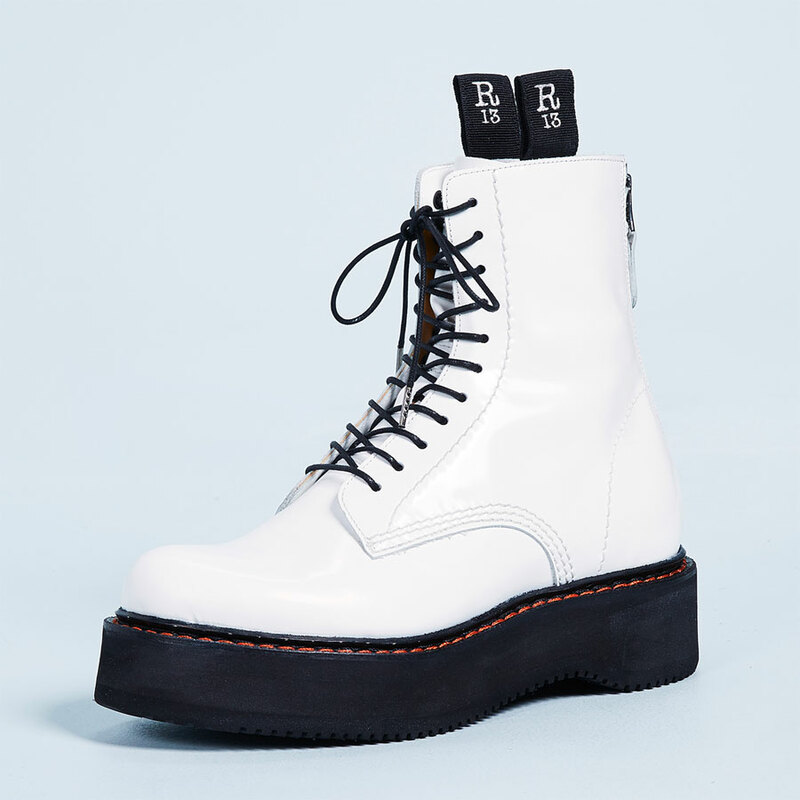 Classic modern with a bit of adventure, ladylike and polished. My favorite of the outfits is the third. I want those plum jeans! I also like the silvery column. Thank you so much for this feature, Inge & Angie! Thank you all for your wonderful comments….YOU MADE my day!!! Have a Merry Christmas and a Happy New Year everyone! Gorgeous lady! What struck me was how everything is beautifully proportioned – Brava! For someone petite Janice styles herself in such a way you would never know that, she looks long and elegant. What I like about her is she looks like she has fun with her clothes, she seems to mix it up and does not lean towards one signature style. She’s great. JAnise is definitely going on my favorite blogger list: I just love her style! Substitute high heels for low or flats and I can wear every single one of them! If I have to pick a favorite it would be the chunky turtleneck with grape coated skinnies. 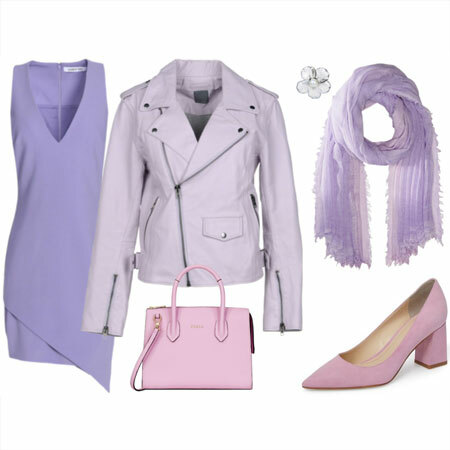 The mix of textures and shapes here is really gorgeous and the pale pink bag looks great with the dark grape color! I love the outfit with the leopard jacket. Great style! I would definitely wear these subbing flats of course. Janise looks beautiful in all of these outfits. What a pretty, polished style. I especially like the white dress and cobalt heels outfit and the red blazer outfit, which looks perfect for a casual holiday get-together. Love these outfits — fresh ideas, but put together in a way that works for real life. I particularly enjoy her wide leg trousers, white dress, and velvet blazer! Love these looks and her style, will be bookmarking for sure. 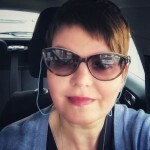 Thanks for featuring another mom over 40 — I always feel a kinship when I see someone who still cares about fashion (and can pull it off) while juggling all the other stuff! Love this, as well that she is a mom of 2 and works. Amazing style. The lipstick seems to be a perfect signature – femme and glam! Suz – It was indeed super fun showing the large variety in silhouettes. And I hear you on having to wrap up in Winter. Patti – How wonderful that you’d already come across Janise. Angie – I know: all six outfits are brilliant. Joy – It’s wonderful to hear that Janise’s style resonates with you so much (I can see why). Sveta – Exactly, a change of footwear is easily done. Rute – I could SO see you wear an outfit similar to Janise’s white dress look. Bubu – Fun to hear you are feeling inspired. Fantastic, love seeing this Mom in Heels, Janice is gorgeous. Janice looks great. I do like her style. Her outfits rely a lot on heels for sophistocated polish, but I can take some pointers from her great use of textures and colors and pattern. Love both of the blazer outfits and could “copy” with some type of flat. 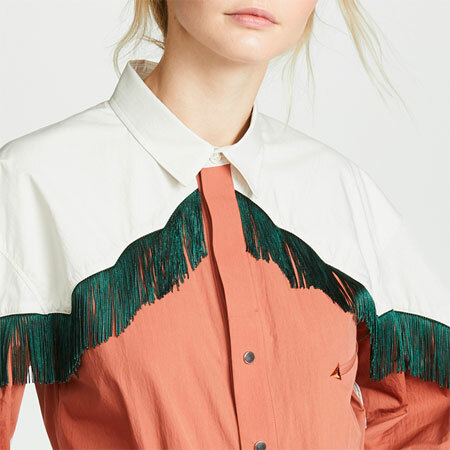 Popover blouses often also work better for me than full button-fronts and I hadn’t thought of the longer, fluid length as an alternative to the big white shirt. Hmm, true high-waisted, wide-legged pants are similar to some I’ve still got squirreled away from a few years ago and thought would have to re-buy in updated version–maybe still would, but might haul them out for a try-on. Thanks Inge! I think I’ll have to start reading her blog. I love all of her outfits. I really like the black trouser and pink floral top. I wish a trouser like that could work as well on a more pear-shaped figure. But it’s inspiration nonetheless! Even though Janise is petite and I’m tall, I really love her style! I’ve added her blog to my list of blogs to follow. If I had to choose one favorite outfit from those pictured here, it’d be the one with the Zara leopard print blazer, although the outfit with the red velvet blazer would be a close second. She is beautiful! And has a very elegant and polished look even when dressing casually. I love all of Janise’s casual dressy/dressy casual looks, especially her jackets and sweaters. And I can really learn from her how a colored handbag can set off an outfit. I think she has it already with: MIH. Thank you Inge – I love all her looks too. Being in an Australian summer the white dress is speaking to me. I adore Janise’s use of accessories, her colour accents are well thought out and unexpected. I have a velvet jacket the same colour as Janise’s one, so when the weather cools off a bit, I will use her look as inspiration – that look is stunning and so wearable. Janise has terrific style – my favorites are the first with the wide leg trousers and the wine jeans with pink pullover. Thanks for the introduction Inge! I just love, love, love her looks! Glamorous and trendy is spot-on! My favorite look is the wide leg trousers and blouse – very 30s/40s without looking too vintage. And the wine and pink is delightful! Some great looks– LOVE that wine colored velvet blazer. Thanks for sharing this. Thanks so much for chiming in, Janise. As you can see, you are an inspiration for our readers! Happy holidays to you and your family! Unfrumped – Definitely try on your older wide-legged trousers again (I’d love to hear your thoughts on them in the forum). Archer – How wonderful to hear that you enjoy the posts so much, thank you! Bijou – Oh wow, fantastic that you have a fab blazer like that in your closet. Have fun sporting it when the weather cools off! Clean modern style that’s interesting. Simple, but definitely not boring. @Ingwe & everyone – Thank you so much for your kind words and your support. It feels great to be part of this community. Looking forward to share more in 2015. Happy Holidays to you all!!! Wishing you and your family a wonderful and very happy New Year!